Little research I have conducted on Russian symphonic metal band Revontulet provides their origin as Moscow. But just getting to know the band's moniker and listening to their full-length debut Hear Me, one would think that they be hailing from somewhere close to the Finnish border, let's say Karelia. 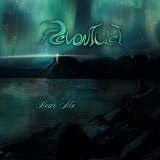 First off, Revontulet in Finnish means Northern Lights. Then, the band has a song titled Suomi on the album. And, finally, it is not possible for me to describe Hear Me without invoking Nightwish, one of the Finnish most famous exports. The band is led by Alexandra Revontulet, but you would be pleasantly surprised to learn that Alexandra provides not only a pretty face and her interesting and characteristic deep-chested mezzo-soprano. She also composes everything on the album, including lyrics and orchestration, relying for arrangements on her bandmembers and for mastering on, you guessed it, Finnish grandmaster Hilli Hillismaa. In a way, then, the vision behind Revontulet is pretty much Alexandra. From the beginning violin orchestration of Blizzard, and the song diving into more full-fledged instrumentation, I had two things figured out: the album promised a number of easy to follow and comprehend melodies, as well as a pleasant, almost relaxing, listen. Regardless whether the songs are more serene and introspective (Suomi, Rainheart) or more passionate and dramatic (The Pianist of the Darkest Night), Hear Me has no shortage of very apparent, catchy melodic hooks. Revontulet is seemingly incapable to produce a composition without such moments. While I am assigning the label of symphonic metal to the band, their sound is not overproduced, stale, plasticky collection of layers. Sure, the absence of the “big-time” production causes the bottom end to be muffled and not as powerful at times, but to compensate Hear Me wins completely on the genuine feel of basking in the music’s warmth. Call it naïve, but Hear Me is what Nightwish used to do around the time of Oceanborn and Angels Fall First. Maybe there is even less sense of drama in Hear Me than that. This is not to say that the album lacks technical moments (syncopated chorus of Blizzard), fantastic orchestration (flute on Suomi, violin cutting to the heart of the matter on Blizzard and Velvet Night, appropriate keyboard parts on The Pianist of the Darkest Night and Eternal Autumn) or multi-part 15 min long statement of a song (title track). Yes, there are moments when I felt a little tedious. Putting Suomi and the start of Rainheart back-to-back is overly soft. Sure, Alexandra voice trails inexplicably downward on an otherwise hitting all marks Infernal Angel. Perhaps, if entered into some Voice competition against Tarja Turunen or Simone Simons, Alexandra won’t win. However, Hear Me in Revontulet’s hands was music from the heart, as they felt it, and that is to be strongly commended in the age when musicians write/play/perform in the way it is supposed to be done, not how they truly see it. You will have to avoid Revontulet if you think metal cannot be made with a gentle touch, without even a modicum of grimness and darkness. On the opposite, if melodic uplifting is how you want your heavier music to be played, this one is an excellent and unexpected surprise.